Mark Steevens provided this splendid tithe map. Tithe maps give ownership data for the whole village; unfortunately, we don’t have that, but the map itself is very beautiful. The history of tithe maps is explained here. Thank you very much, Mark. The copy here has been pasted together from a number of digital images and pulled and pushed to make it all fit, so it’s not a great piece of geography, but it does show the houses that were present and even most of the trees. 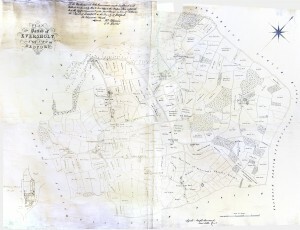 The tithe map seems to be a marked-up version of a generic parish map. The label says “Standidge & Co Litho, 77 Cornhill, London. 1838”. Click for a much, much bigger version! 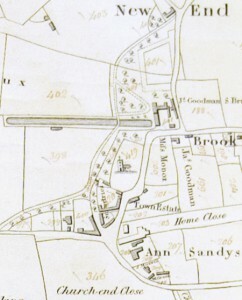 Here is a detail from that map showing the area around the church. Sorry, all these links need re-making to work with the new website. The numbers on the various plots are the index into the tithe book that goes with the map, telling who owns what. The building in the plot marked 201, “Town Estate”, is the old poor house. 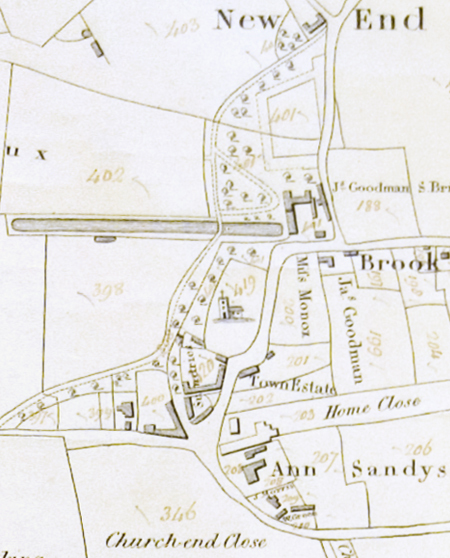 The building in plot 400 eventually became School House, but was probably a farmhouse in 1838. There’s a picture of it around that time, here. Church Farm is shown in plot 203. The house now known as Linden House in 2012 is shown owned by Ann Sandys. Then, it was called Eversholt House. The grand house on the cricket pitch, called Linden in 1838, is in great shape. The whole area was called New End. The Linden great fishpond hadn’t then been filled in. What is now Linden Lodge, at the top of the picture, looked rather different then. Presumably, it’s been rebuilt since that date.